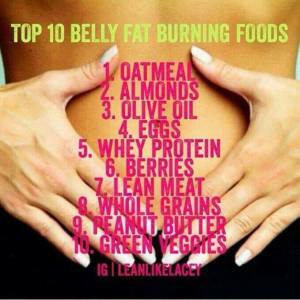 12 flat belly ways to tame that bloated belly. A few studies suggest that peppermint tea, ginger, pineapple, parsley, and yogurts containing probiotics (“good” bacteria) may help reduce bloating. Eat mores salmon, avocado, raw almonds, watermelon, sauerkraut, Kefir, kombucha, kimchi, pickles in brine ( sea salt & water), Miso soup, berries, garlic, oatmeal.